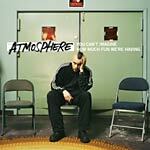 Atmosphere is back once again with their fifth studio album, 'You Can't Imagine How Much Fun We're Having,' the follow up to the two year old, 'Seven's Travels.' Entirely produced by Ant. This is what you have been waiting for.